Disney’s $4 billion purchase of Lucasfilm in 2013 promised corporate synergy with enough power to fuel the Millennium Falcon. 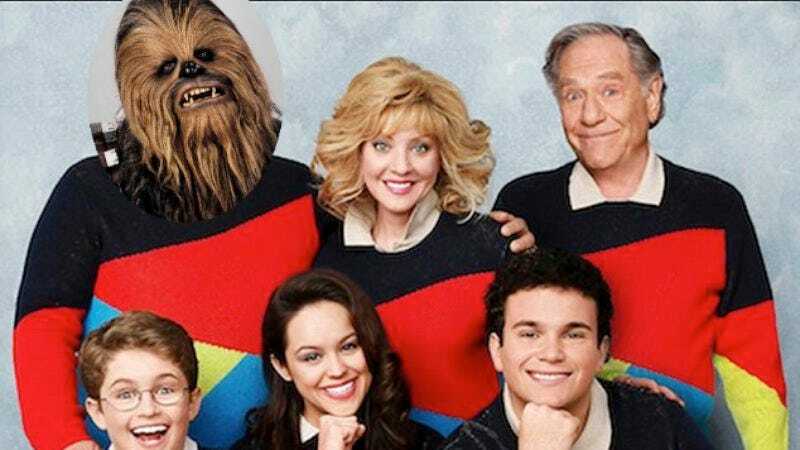 Increasingly the Disney-owned ABC has been cashing in on that lucrative merger, and while it seemed like only a matter of time before Billy Dee Williams’ Dancing With The Stars routine would be followed by a certain Alderaan princess making a cameo on Once Upon A Time, The Goldbergs is the first ABC property to get in on the cross-promotional spirit. In honor of Star Wars Day on May 4, the 1980s-set comedy will feature an episode that takes place with the family standing in line for the opening of Return Of The Jedi. (Since May 4 falls on a Sunday—the better to host Jedi-themed parties—the episode will actually air on May 6.) According to The Hollywood Reporter, “A Wrestler Named Goldberg” will follow the show’s child leads as they interact with “elaborately costumed Star Wars fans.” Reno 911’s Thomas Lennon will play one of those enthusiasts, hopefully of the Slave Leia variety. Lucasfilm is apparently hedging its bets, as it was recently announced that the company will also help create a Star Wars-themed episode of CBS’ The Big Bang Theory. While the two shows will offer different takes on fanaticism, they’ll both likely perpetuate the lie that Star Wars is a fringe entity beloved only by nerdy weirdos, and not an immensely popular part of mainstream culture.